The Call of Duty Ghosts Gamepack for Titan One has 45 distinct MODS grouped into 12 classes, specially optimized for Call of Duty Ghosts. Quick Scope is widely used in Call of Duty games. The idea behind quick scope is to use a sniper rifle, scope IN and fire the shot as the gun scopes in. Perfecting the aiming and timing will allow you to become a one-man commando with your sniper rifle. To fire a quick scope shot, quickly TAP your scope button (less than 140 ms tap) . The MOD will automatically scope in, take a shot, and scope out. Check the menu system instructions above for more information on how to adjust the timing in this mode. 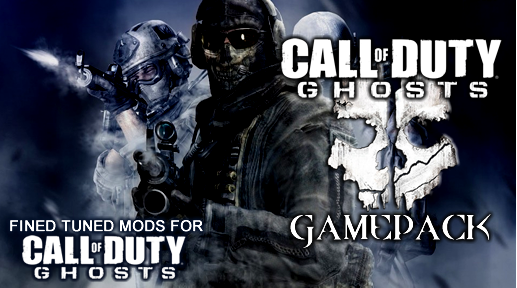 Auto Aim MOD is specially designed for the Call of Duty Ghosts campaign mode. Auto Aim allow you to auto-aim to the nearest enemy while scoping your rifle. Any time you pull the left trigger to aim it will lock to the nearest enemy. Reload a weapon fast than normal, using sprint cancel technique. Turbo Knife optimized for CoD Ghosts. The CoD Ghosts Gamepack allows you choose and combine one MOD from each Class, being possible to have a total of 12 active MODS at the SAME TIME. This means you can make combinations such Burst Fire added to Rapid Fire, resulting in an exclusive "Automatic Burst Fire" MOD. The Automatic Burst Fire can be optimized by adjusting the number of bullets fired per burst as well as the time between bursts. For additional optimization, you can add the "Scope Enable" MOD, which will make the Automatic Burst Fire be activated only when the ADS scope is in use.